Fuel Storage | Senkox Technologies Inc.
Petroleum storage tanks and cryogenic storage facilities (liquid natural gas, LPG, ethylene, ammonia, etc.) require sensitive monitoring in order to allow for ample warning of elevated temperatures prior to combustion. By providing advanced notice of rising temperatures, appropriate steps can be taken to prevent disaster. Senkox HSD™ Linear Hot Spot Detectors are an ideal solution to fill this role. The flexible Senkox HSD Linear Heat Sensor cables can be directly mounted around the tank. The system provides real-time temperature monitoring and also detects the precise location of hot spots. As a result, safety personnel have real-time data of the thermal conditions of the storage tanks. This feature provides advanced warning and extra time for working personnel to counteract the repercussions of overheating. Floating roof tanks are vulnerable to elevated temperatures due to the highly abrasive environment and presence of flammable gases. HSD Linear Hot Spot Detectors are most likely to occur near the secondary seal of a floating roof tank, as these are the areas that suffer most from high abrasion and the presence of flammable gases. The HSD sensors are installed along the secondary seal of the floating roof tank to provide real-time data regarding temperature changes. Spherical storage tanks are commonly located in areas of high fire risk. 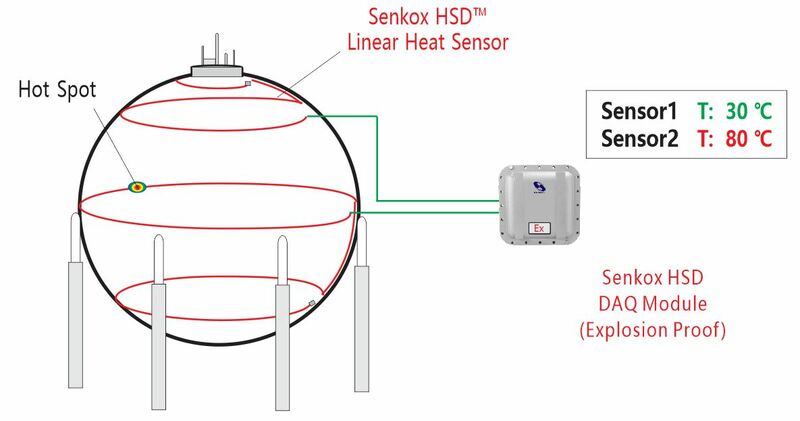 HSD sensors are installed on the surface of the sphere, allowing continuous temperature monitoring. Detection of any hot spots will trigger location specific sprinkler systems. Intrinsically safe; can be installed in hazardous locations. Rugged sensors with extra strength protection to withstand high abrasion and stress. Sensors withstand high temperature and can be restored after alarm. Simple system layout, easy installation and maintenance. Provide the rate of temperature change (ROTC).